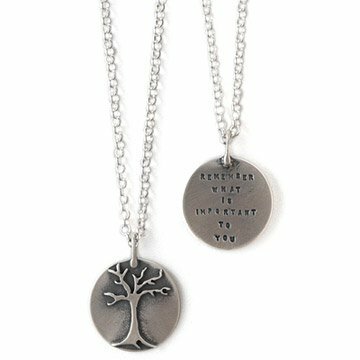 Kathy Bransfield's handmade pendant pairs a single tree on a sterling silver circle with inspiring words. "Remember what is important to you." A simple phrase that carries so much meaning finds new life as a beautiful necklace. Artist Kathy Bransfield pairs a single tree on a sterling silver circle with the soul-searching saying on the back. The simplicity of the pendant will make it even more special and thought provoking to the wearer, and it will be a constant reminder to always keep your life in perspective. Handmade in Southern California. Chain 17" L, Pendant .7" dia. I bought this necklace for myself a couple of years ago and I wear this beautiful necklace daily. When I get really stressed, especially at work, I rub this necklace between my fingers to remind myself of what is important in my life. It gets me through the day. I actually feel lost when I don't wear it. Would definitely recommend this necklace. I was looking for a unique and meaningful gift for my 17 year old daughter and this fit the bill perfectly! A meaningful gift that is well crafted. I wish there was a choice in the length of chain, otherwise the product was was crafted. Christmas gift for my daughter, she is a young women with a beautiful heart. This necklace is great the handmade design and detail are perfect. Fantastic gift. She got some great compliments on it. The pendant is absolutely beautifull and one of a kind. I love the message. Couldn't be happier with it. My only small complaint is that the chain that came with it looks cheap in comparison with the pendant. No biggie though. I kind of expected that. I wear this pendant every day. It's a wonderful reminder of what's important.